Tesla drivers were more likely than Porsche owners -- or anyone else -- to say they’d buy their cars again in this year’s edition of the closely watched Consumer Reports buyer survey. Tesla’s Model S luxury electric sedan topped the U.S. survey a second year in a row, scoring 98 out of a possible 100, after posting a 99 last year. This year’s No. 2 brand, Porsche, scored an average of 87 out of 100 across its model lines. Palo Alto, California-based Tesla, co-founded and led by billionaire Elon Musk, said last month that it expects to sell 50,000 Model S cars next year. “Not only is the Tesla roomy, comfortable, and a lot of fun to drive, but it also has low operating costs,” Consumer Reports said. The survey will bolster the 11-year-old carmaker’s image as the leader in the business of making high-end electric cars. 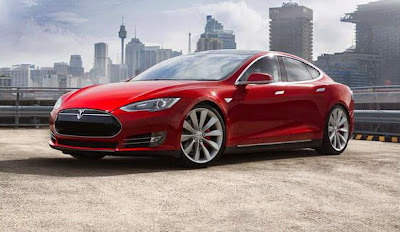 Tesla plan to expand sales of the Model S and develop the long-awaited Model X SUV, which is expected in the third quarter of 2015. Tesla stock has gained 52 percent this year. The next three most satisfying vehicles in the Consumer Reports Survey, after the Model S, were sports cars: General Motors Chevrolet Corvette Stingray, with a 95 percent satisfaction rating, and Porsche Cayman and Boxster, which tied for third with 91 percent of buyers saying they’d purchase them again. The survey covered 350,000 vehicles from one to three years old and took into account “attributes such as styling, comfort, features, cargo space, fuel economy, maintenance and repair costs, overall value, and driving dynamics,” Consumer Reports said. Hybrid, electric and diesel-powered cars outscored gas engines throughout the survey, with the Chevrolet Volt and Toyota Prius leading the compact-car category and Honda Accord Hybrid and Ford's Fusion Energi atop the list of mid-sized sedans.